I really love this book. I've read it once, picked through it several times, and now I'm listening to Derek Thomas lecture on it at Ligonier.org's Daily Video. (1st lecture in the series here). There is a part 2 to Pilgrim's Progress that Thomas urges us to read, as both parts are meant to be a coherent whole. I had not known that. John Bunyan (unknown birth date, baptised on November 30, 1628 – August 31, 1688) was an English writer and Puritan preacher best remembered as the author of the Christian allegory The Pilgrim's Progress. In addition to The Pilgrim's Progress, Bunyan wrote nearly sixty titles, many of them expanded sermons. Let me start you with a hint: Begin on the left side and read through circles one to 25 as a big, long sentence. When that’s complete, do the same for the other side. Finally, go back to read the verses and additional information. I think you will find, as I did, that the first sentence is terrible and chilling while the second is beautiful and encouraging. Whatever you do, linger. Bunyan has a lot to teach us through this infographic. 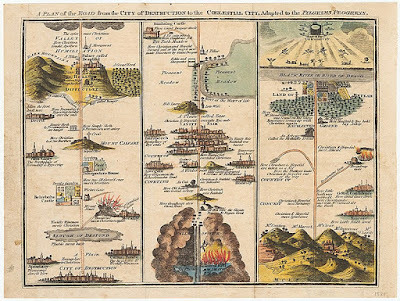 Here's a link to Bunyan's original (and IMO, better) map. Bunyan's spiritual autobiography, Grace Abounding to the Chief of Sinners, is also a wonderful book. You can find a free text version online here. Or here in .pdf form, which you can download and then send to your Kindle via Kindle email attached as a file and it will be installed on your device. Since Bunyan is so well known for Pilgrim's Progress, few people know he wrote so many other books. Anyway back to the book Pilgrim's Progress. Why is this book important? The book that became known to posterity as The Pilgrim's Progress is a Christian classic whose importance is impossible to overstate. For more than two centuries after its first publication, The Pilgrim's Progress ranked just behind the King James Bible as the most important book in evangelical Protestant households. Te book has been translated into some two hundred languages, including eighty in Africa. Any book that has achieved such popularity has a very large claim to our attention. Facts of Publication The Pilgrim's Progress actually has two publication dates, corresponding to the two books that comprise it. The first book was published in 1678 and bore the title The Pilgrim’s Progress: From This World to That Which Is to Come, Delivered Under the Similitude of a Dream. It tells the story of the spiritual journey of the protagonist named Christian from the City of Destruction to the Celestial City (meaning heaven). Book II was published six years later as part of an old artistic tradition known as a "companion piece." It tells the story of the same journey, this time undertaken by Christian’s wife, Christiana, and their four sons. The hard part for me when reading Pilgrim's Progress is not the 350-year-old language. Though, if the language presents a difficulty, there are free updated, modern language versions available, both for free online and in hard copy. What I find hard is the abstractness of it, because I'm very literal. I do not understand allegory or symbols in literature. Allegory is a figure of speech in which abstract ideas and principles are described in terms of characters, figures, and events. It can be employed in prose and poetry to tell a story, with a purpose of teaching or explaining an idea or a principle. The objective of its use is to teach some kind of a moral lesson. Although an allegory uses symbols, it is different from symbolism. An allegory is a complete narrative that involves characters and events that stand for an abstract idea or event. A symbol, on the other hand, is an object that stands for another object, giving it a particular meaning. Unlike allegory, symbolism does not tell a story. I enjoyed Ligonier Theologian Derek Thomas in these free 23-minute lectures explaining Pilgrim's Progress, both parts one and two. I found them extremely helpful in understanding the book. In addition to explaining the allegories and what they (likely) stood for, Thomas folded in Puritan history and culture of Bunyan's day and set the context for how Bunyan thought and what was happening in his life as he wrote the book. This information gives depth and nuance to understanding it. Another resource for this marvelous book is Notes & Commentary, Guide to Pilgrim's Progress by Ken Puls. 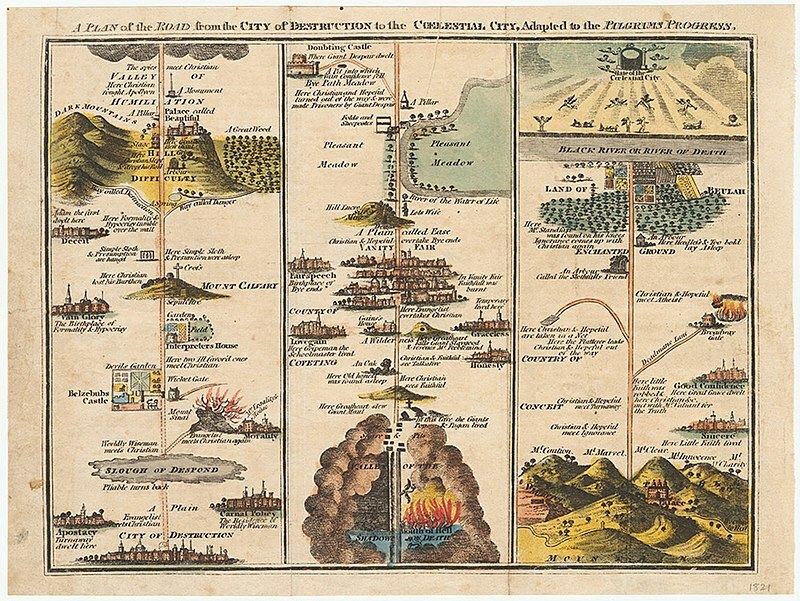 I hope you enjoy the resources and would consider reading The Pilgrim's Progress. Why are the Doubting Castle and "Honesty" so far apart? Reposting over at my own site where I have posted quite a few times encouraging people to rediscover Bunyan.